Although Kolkata is a relatively young city, there are some well-known haunted spots in the city, most of which are associated with its colonial past. Know about the interesting spots of Kolkata in this two-part article. Want to visit these spots? Kolkata is not a very old city like Varanasi, Allahabad, Lucknow, Pune, Thiruvananthapuram or Delhi. Job Charnock, an official of East India Company, took the lease of three villages, viz. Sutanuti, Gobindapur and Kolkata, in 1698. Much later during the last part of the eighteenth century, these three villages developed into a new city which eventually became the second largest city of British India. Although Kolkata is a comparatively young city, there are no dearth of haunting spots in this city. All these spots are associated with some ghastly and bizarre story. In this two-part article, we will try to know about some haunting places of Kolkata and the stories associated with these places. The biggest library of Asia is located in a sprawling mansion, which was the residence of the Governor-General when Calcutta was the capital of British India. Many eerie stories are associated with the library and building. It is believed that the spirit of Lady Metcalfe, a book-lover, visits this library at night. Some people say that they have seen this spirit. Very recently, a secret chamber without any door has been found in this building. Indeed, the mansion is considered a well-known haunted place of the city. This is just beside the National Library. It is another famous haunted house in the city. This mansion is presently housing a Girls' school (Alipore Multipurpose Girls' High School) and a Teachers' Training College. 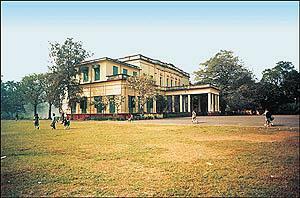 This mansion was built by Warren Hastings, a Governor-General of Bengal province. Some people say that an English nobleman enters the estate at late night on horseback. There are many stories surrounding this building including the duel between Warren Hastings and Phillip Francis. Some years ago, a young boy died mysteriously while playing football at Hastings Ground. It is said that the spirit of this young boy also roams here at night. This building had been the administrative centre of Bengal since late eighteenth century till very recently. Only in 2014, the West Bengal administrative headquarter was shifted from Writers' Building to Nabanna, a newly-built complex. But still, now some departments of the State Government are located in Writers' Building. There are some unopened spacious room in this building which creates more mystery. The employees are extremely reluctant to sit till late hours in this building. Many people have heard inhuman cry coming out from the closed rooms of the building. It is another known haunted spot in the city. The Ganga is the most sacred river of India. However, there are some ghats in Kolkata which have witnessed suicides. It is stated that these ghats, especially Mallik Ghat and Zenana Ghat, are haunted. Many people claim that they have seen grey figures roaming the ghats in very early mornings. Some people also claim that greyish hands are seen desperately trying to come out of the water. It must be noted that the spirits are said to be seen in the early morning. It is not an ancient place. This beautiful station was established in early 1984. It is one of the busiest stations of Kolkata Metro. But there have been many suicides in this station. Shadows and semi-transparent mysterious figures are seen at night behind the pillars of the station. People try to avoid this station at night (after 10 p.m). I have mentioned five well-known haunted spots in Kolkata in this article. I will present another five spots in the next part of the article. 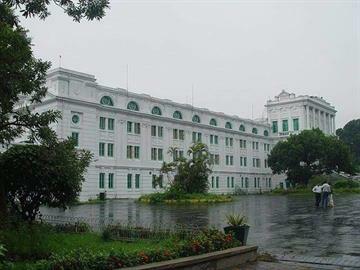 In our country after the departure of Britishers, there are many places, especially in hill stations and big towns where the palatial and spacious buildings made by them were not fully occupied by us as they were either converted to libraries or offices which generally remain closed during night hours. In such conditions, the local public of that area imagines many things about these buildings which are mostly of conjectural nature and any incident or accident happening in those premises is taken as a sign of haunted place. Anyway, the isolated and less occupied buildings get that tag due to the imagination and curiosity of the people and then the information spreads to the public at large. Thanks to Mr. Umesh for reading the first part of the article. I hope that he would definitely read the second part also.So far as the haunted places of Kolkata are concerned, the Hastings House, Race Course (mentioned in the second part), Old AIR Building (mentioned in the second part) were known as haunted places even during the later part of British rule. Moreover, Rabindra Sarobar Metro station and Wipro House at Salt Lake (second part of the article) are modern structures. So, the theory of Mr. Umesh associating the haunted houses with the fascination for British rule does not always hold true. I feel that when people hear about the stories associated with haunted places, they become mentally weak. So, their sub-conscious mind hallucinates. Of course, this is my theory.